Back in 1999, I moved to Turkey and spent several years living and working there. It was a fantastic experience and completely opened me up to experiences around reading landscape energy, finding places which are still off the radar screen and discovering the excitement of how real growth can sometimes happen in the most unlikely of places. I’ll blog more about some of these places later but for today I’d like to share an experience I had at the ancient Roman city of Ephesus. 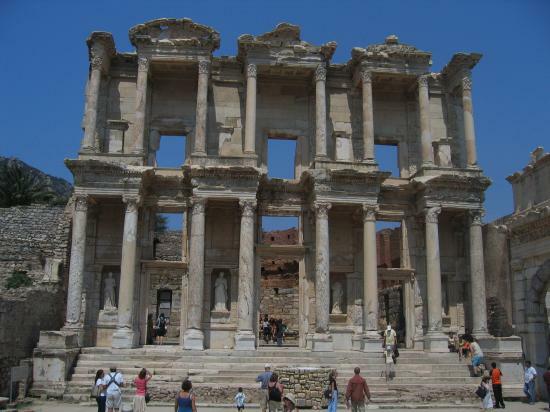 The ruins of Ephesus itself are quite impressive and if you’ve never gone, it is well worth a visit. 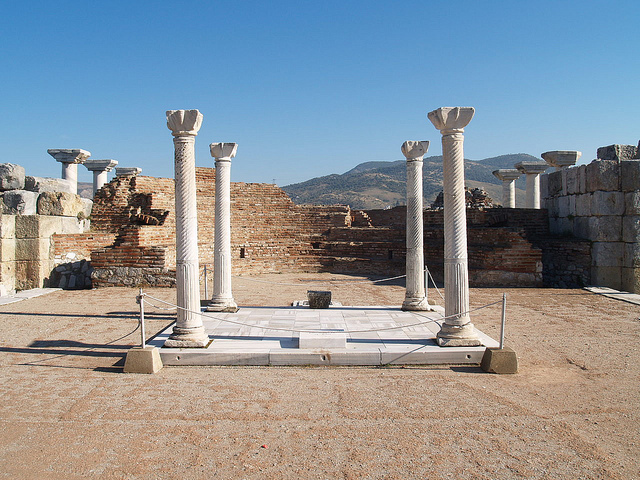 Outside of Ephesus, you have a small town called Selçuk (pronounced Sell-chook), which has all the hotel, hostels and bus connections which pretty much services the local tourist industry for Ephesus and area. 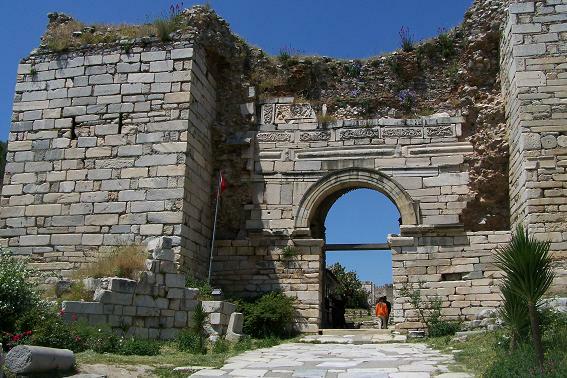 Selçuk has the ruins of a very interesting basilica, namely The Basilica of St, John the Divine (or John the Beloved, depending on what church you belong to). This John, (and not John the Baptist) is the alleged writer of the Book of Revelations or the Apocalypse. You know the one. The part of the Bible which talks about the Seven Horsemen of the Apocalypse, plagues, the Whore of Babylon, and all sorts of weird and wonderful symbols and codes which people have tried to interpret for centuries especially around “The End of the World” but have never really understood what it’s all about (I like mystics who manage to dupe so-called experts like Popes and theologians). 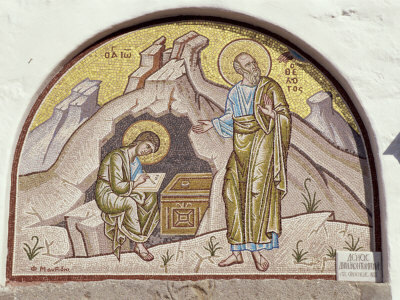 Greek Orthodox icon of John writing down the visions , over the entrance way into the cave of the Apocalypse. Patmos, Greece. Local Orthodox and Coptic Christian legend holds that as Jesus was dying on the cross, he gave John, his brother the charge of looking after their mother, Mary. Both lived out their lives well into old age and died at Ephesus. 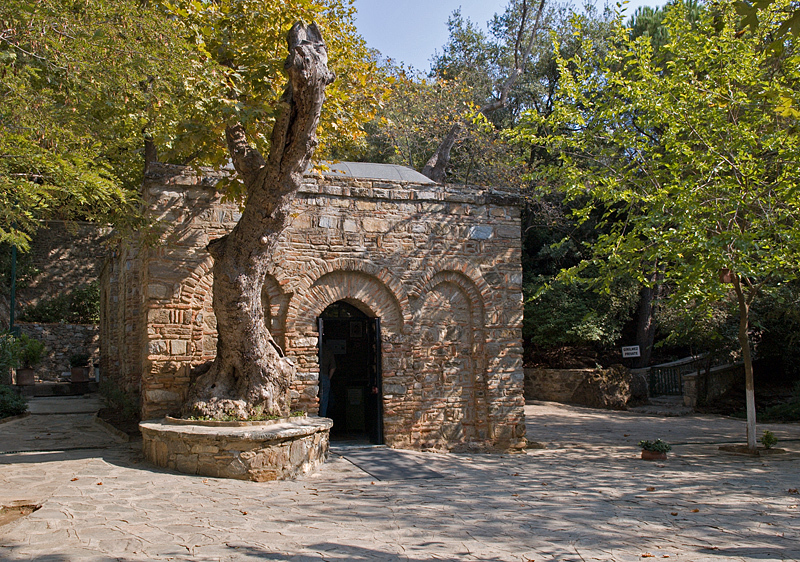 The House of the Virgin Mary is also nearby, at the top of Nightingale Mountain. I had an experience there too but will write about that another time. John is said to be buried here. While the exact site of the tomb was not clear. 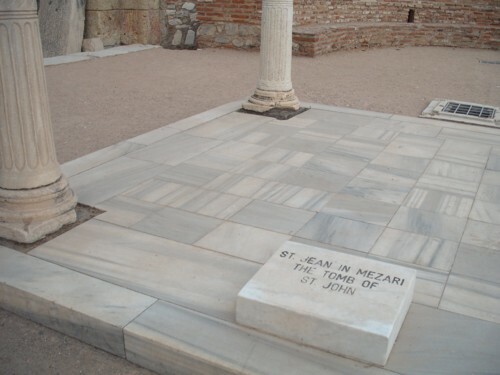 St. John’s supposed grave was marked by a memorial and enclosed by a church of modest proportions in the 4th century. In the 6th century, Emperor Justinian (527-65 AD) believed that a tomb dating from the 300s was John’s, so he built a magnificent church on the site dedicated to the saint. It is the remains of that church that can be visited today. Most of it is rubble now, because of Turkey’s numerous earthquakes through the centuries as well as the Turkish conquest of the area later on. It was December 31, 1999, The Big Millennium. People were freaking out over Y2K, celebrations and fireworks were out in full force at all the major cities around the world. I spent most of that afternoon here, by John’s grave. The place was deserted, no summer tourists, no Christian pilgrims, no one, it was utterly empty, I had the entire site to myself. The old caretaker was practically asleep at the gate but very kindly let me in and said that they would be closing early today but if I wanted to stay longer, I was free to do so. I suppose that means I was the very last person to visit his grave for that millennium. After exploring the site, I perched myself on the step-like ruins overlooking the grave and got my journal out to write about my impressions. This is what came to me. “It’s been almost exactly 2000 years since you’ve been here. What were once mighty cities, now lie in dust and rubble, what were once shrines, now lie in ruin. The transience of this world is all to clear to me now, and indeed only love is eternal. The world has gotten worse since you last walked these eternal hills, I sometimes wish the Apocalypse would take place if only because there is so much purification which needs to take place…one by one, the prophets voices have been lost over time…people have forgotten their souls, they’ve become too clever, everyone always wants a shortcut…love, compassion, truth and forgiveness have left man. Brother kills brother, daughters turn on their mothers, people don’t know where they come from anymore. Rudeness, hate and greed rule all. Perhaps the world is not all that different from your time and there truly is nothing new under the Sun, we just treat our problems differently…The empires have changed hands, in your time, it was the Romans which persecuted you. Now it’s the Americans which see to it that everything beautiful and pure is automatically uglified and put to sale. They are so young, stupid and arrogant! They have no shame or humility anymore. It seems that those things are now out of fashion…The voices of the old prophets need to be heard again. Everything in this world comes to an end eventually, doesn’t it? Empires, realms, kingdoms and leagues, all of it disappears, human lives come and go as the wind comes and goes at will. What is the meaning of it all? At the heart of it? I finally understand that the only antidote to transience is Love. Love finally is the “glue” which holds this universe together, Love is what keeps the dance between electrons, neutrons and protons going. 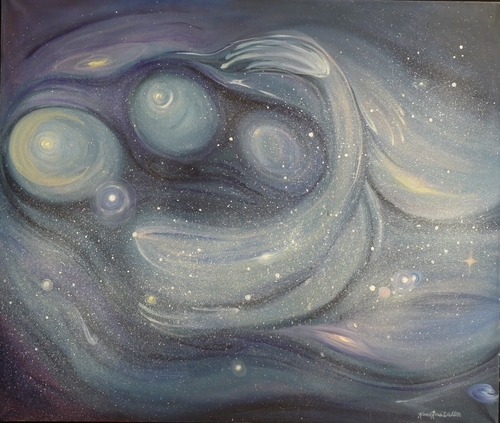 Love is the force which dictates Her will on the planets, stars and galaxies. Love is finally the only thing that truly is eternal, placing your bets on anything else will always fail. This world as we know it will pass too one day, what we think are powerful countries and empires today , one day will expire also. What we think are important today, money, power and fame, will one day be rendered meaningless. The meaning of life is finally to be an instrument of Love, that’s all we can do, that’s all we are asked to do. And we are tested on this daily. Our interactions with people, our thoughts, our words, our gestures, are constant trials to decide which path we want to follow. Do we choose Love or do we choose fear? The old Chinese and Asian philosophers were right all along in dictating humility and humbleness. The only way to allow the dance of the universe to continue unhindered and unimpeded is to finally step aside, forget your ego, forget your personality (not your individuality), know damn well what your place is in The Big Picture and quietly, step aside. The Universe knows what it is doing far better than we ever will, this is why Eastern spirituality has always extolled the virtues of detachment. Detachment does not mean becoming cold and unaffected to the ills of this world. Rather, detachment means to be an informed spectator of the laws of the Universe at work. Everything in excess will always lead us to harm except for pure, detached, unpossessive Love. Passion, if taken too far, can become obsession and jealousy. Rather, passion must be sublimated and transmuted into unrestricted, unpossessive love which leads to true bliss. The secret to life is to fall in love with Existence itself, to fall in love with the clear light of day, the clouds, the sky, the rain, the Sun, the cold, the heat, the wind and the stars , to love every fragment of every atom that falls in front of you, and once you can do this, you will have come into you own, you will have become a source of your own love, the seeking stops and the answers to all your questions appear. You will have finally become all that there is, no more and no less. Thanks for this. I have been planning a pilrimage to Rumi’s tomb in Konya for twelve years, but my plans keep getting derailed. If I get the chance to go I will visit the Basilica of St. John the Divine and the house of the Virgin Mary as well. What you have written of here, and being taken in by the Hopi Elders, are things that can’t be bought at any price. I think the phoney “spiritual teachers” get frustrated as hell when they read things like your Oraibi post. They would love to have similar experiences, but they never will, until they are willing to do the hard work, and make the sacrifices required. So they make it up, like James Redfield. Raising one’s resonating frequency is hard work; it takes years of study, years of solitary contemplation and prayer, past wrongs acknowledged and apologies made, help offered with nothing expected in return. Sometimes it seems like you’re making no progress at all. Then one day when you least expect it, a door swings open to incredible experiences and meetings with amazing people. In other words, you have already paid the price of the ticket into wonderland. I don’t think a totally free Internet will be around much longer, but as long as we have it, those who have had genuine experiences on the solitary seeker’s path have a responsibility to share them online. The hucksters have monopolized the conversation far too long. All we get from the controlled media is pablum; fluffy. feel-good spiritual junk food. We need to at least try to counterbalance the massive propaganda churned out by Oprah and her ilk, that you can read a book or attend a seminar and receive the key to spiritual truth and everlasting happiness. This is like a detour sign to a road going nowhere, and it does a lot of harm. This is a call to veteran seekers: put your stories online. If a techno-illiterate who doesn’t own a computer (me) can do it in two different languages – no excuses accepted! If you truly “get it” then you understand that the work doesn’t end with yourself.It’s about everyone else “getting it” as well. SFF, thank you for your kind words. Indeed I had to do years of work on myself before I got there and the work continues now. It never stops. I couldn’t agree more. This dialogue of “spirituality” has been hijacked by the Oprah crowd and it’s not truly helping anyone, least of all the purchasers. These false teachers who are just telling people what they want to hear and are more interested in fattening their investment portfolios or becoming media darlings will have a heavy price to pay down the line for leading so many astray. The ones who keep buying the bestsellers, self-help books and attending retreats at the Omega Institute are on a consumerist cycle without even realizing it. Real spirituality is about facing the music about yourself, without flinching. Not having some Guruji giving you a Hindu name and that somehow because he’s bestowed this name, you’re somehow protected by his aura and you can still go around acting like a pig or repeating a certain prayer and the Angel Metatron shows up at your doorstep. No way Jose. I also went to Konya to visit Rumi’s grave and watched the Whirling Dervishes dance. The Sufi compound and area are quite impressive. In the attached museum, they even have a hair from Mohammed which they keep as a relic. I’m itching to go back to Turkey and need to investigate the area around Antakya (ancient Antioch), Hatay and Iskenderun. In recent years there have been a disproportionately high number of children being born in that area with immediate past-life memory. The area has been known for centuries as full of hermits and people who practice the Islamic forms of magic (black and white) but with the deteriorating situation with Syria a mere 40 km away, the area is unsafe and probably off-limits now. There’s also the Grotto of Paul and Peter I’d like to see. 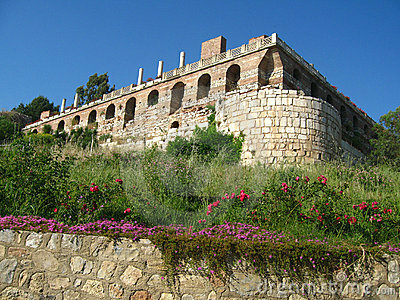 If you go to Turkey, Ephesus, Cappadocia, Istanbul, Konya and the Black Sea coast are musts!